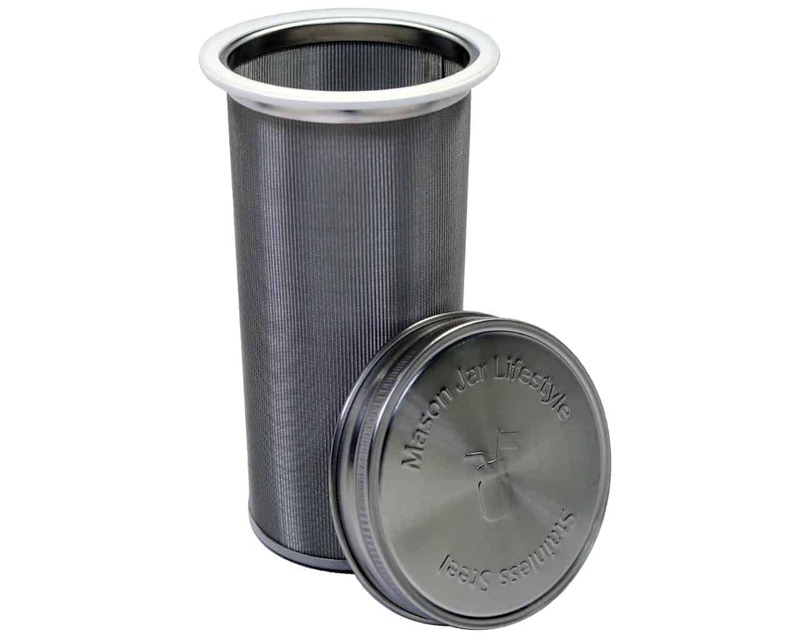 One very fine mesh stainless steel filter that fits a wide mouth (3″ internal diameter) Mason jar. One wide mouth stainless steel lid to make everything leak proof and dishwasher safe. Use it to make cold brew coffee or iced coffee concentrate, hot or iced tea, nut milk, infused water or alcohol, or to filter or strain any liquid – all right in the jar! Scroll down for recipes. Use this filter system to make delicious cold brewed coffee and steep loose leaf tea for the perfect, smooth beverage any time of year! Coffee and tea made through this system is good for you and the environment. Did you know that cold brewed coffee has a lower acidity level, which is good for your teeth and your stomach. Because it’s never been heated, the chemistry isn’t changed, you can save it in your fridge for a week or two and the taste is never altered. Cold brewed tea is also lower in tannins and therefore provides a smoother drink. Loose leaf tea is better for the environment because it uses fewer resources by skipping the bag and tag. You can compost your leftover grounds and tea leaves for a richer garden. Two different silicone seals in order to make it leak proof. Use only one at a time. Cold Brew Coffee – To make cold brew coffee concentrate, fill the filter tube about 3/4 full with coarse ground coffee, to allow for swelling. Pour in cold water to fill jar and allow it sit on your counter or in your fridge for 24 hours. Loose Leaf Tea – To steep loose leaf tea, combine 1-2 teaspoons of your favorite tea with 6-8 oz of cold water and place in fridge. Steep white or green tea for 6 to 8 hours; steep black or oolong tea for 8 to 12 hours depending on desired strength. Hot Coffee or Tea – You can also use this filter to make hot coffee and tea. Put the grounds or leaves in the filter, pour in 200 degree water, and wait a few minutes. Once brewing/steeping is complete, remove the filter, dump grounds/leaves into your compost, pour over ice, add your favorite coffee/tea additions and enjoy! Keep your brewed coffee and tea in your Mason jar fresh and leak proof with the other silicone seal and stainless steel lid included. Be sure you use coarse ground coffee! A higher quality coffee grinder will give you a more consistent coarse grind. Cheaper grinders produce a mix of coarse all the way down to powdery grinds. This filter is very fine, but silty coffee grounds can get through. The cold brew coffee concentrate will be strong, so you may need to dilute it. Serve it hot or over ice, add sugar or dairy, or any other way you like! To make a more concentrated version, use more coffee grounds or steep for longer. Cold brew coffee is commonly made very strong and diluted at serving time. If your filter is already in use, you can put your coffee grounds or tea directly into the jar. Once your filter is available, pour the contents through the filter into a new jar. They are 10cm, 15cm, and 21cm tall. The mesh part is 7cm in diameter. The mesh is 100 micron for the new style in box and 150 micron for the older style. All parts are dishwasher safe, and I find this the easiest way to clean them.